The Campus Theater is located on Main Street in downtown Lewisburg, Pennsylvania along the Susquehanna River which is the home of Bucknell University. It was designed by architect David Supowitz, and built by the Stiefel Brothers construction company in 1941. This premier single screen Art Deco revival-theater is one of only five theaters of the original 24 designed by Steifel that is still standing or operating as a theater. The Campus Theater is considered the crowned jewel of its type. Throughout the years the Campus has undergone only a few changes and the majority of its interior retains its original architectural design elements and interior Art Deco painted decoration. In 1941 it was one of only a few theaters with air-conditioning, a fire-proof structure, seats that rose automatically when empty, and chrome plated turnstile for “ticketless entry.” The interior was richly decorated with painted designs, allegorical figures, bronze & aluminum leaf, and trompe l’oeil painted side curtains. Neon lighting adorned the walls and ceilings, and lighted glass blocks directed your entrance into the theater. The four Stiefel brothers emigrated from Russia in the 1920’s. Oscar initially operated a theater in Philadelphia and the brothers slowly began build and manage theaters in Pennsylvania, New York and New Jersey. The Stiefel brothers eventually ran 11 theaters in Pennsylvania. By the early 1950’s one of the brother’s sons, Harold took over the operation of the Campus Theater from his uncle Barney who was retiring. The theater was managed by Harold and his wife Jacquie until Harold’s death in 1988. Harold had become quite a fixture in the community and was well known by all. Jacquie continued to operate the theater until 2001 when she sold it to a Bucknell University film professor. In order to help him maintain the facility he created a not-for-profit corporation, which eventually purchased the theater from the professor in 2006. In January 2011, Bucknell University took over ownership of the theater and leased it back to the not-for-profit corporation, The Campus Theatre, Ltd. for $1.00 a year. 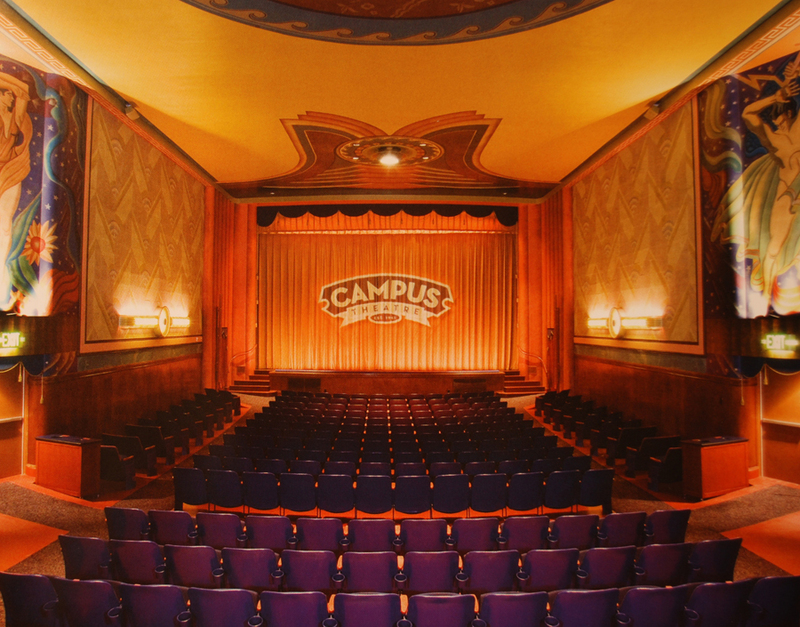 The Campus Theatre, Ltd. continues to schedule movies and operates the theater, which is open to the public. 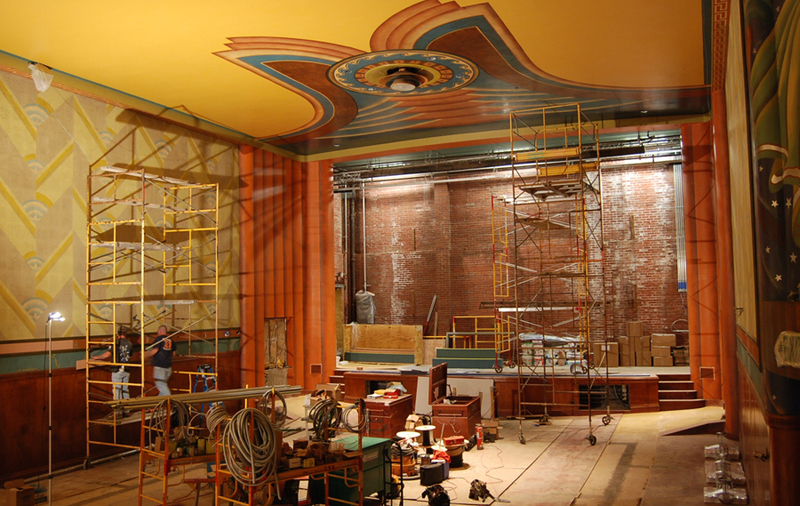 To preserve the rich historic heritage of theater and its place in the community, Bucknell University undertook a major renovation of the theater, restoring some of its lost architecture, upgrading its systems & infrastructure, and installing state-of-the-art theater movie and sound systems. In late 2010 Hartmann Fine Art Conservation Services, Inc. was fortunate to be included in the development of the architectural design drawing and specifications for the huge renovation, preservation and conservation effort. Hartmann Conservation worked closely with the design architect, Ted Strosser of Strosser Architecture and Conservation based out of Lewisburg, Pennsylvania. The contract for construction was awarded early in 2011 to RS Mowery & Sons, Inc. of Mechanicsburg, Pennsylvania. 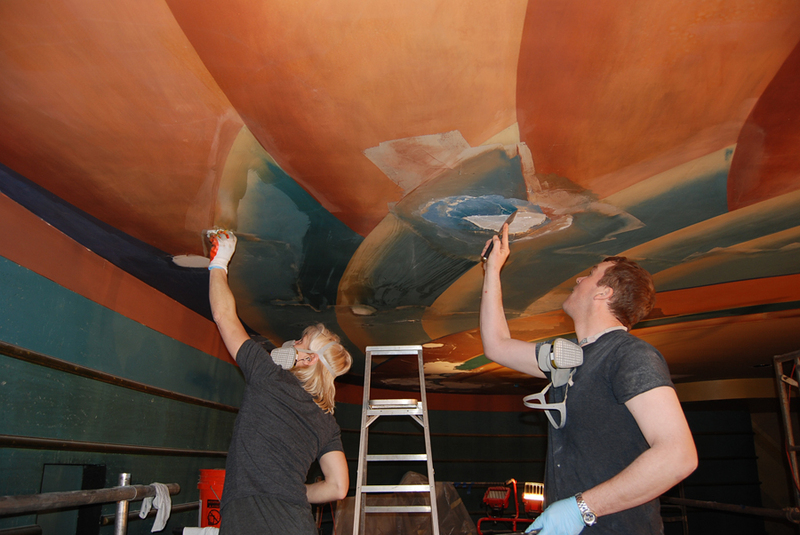 Hartmann Conservation was chosen to undertake the conservation of all decorative painted surfaces inside the theater. 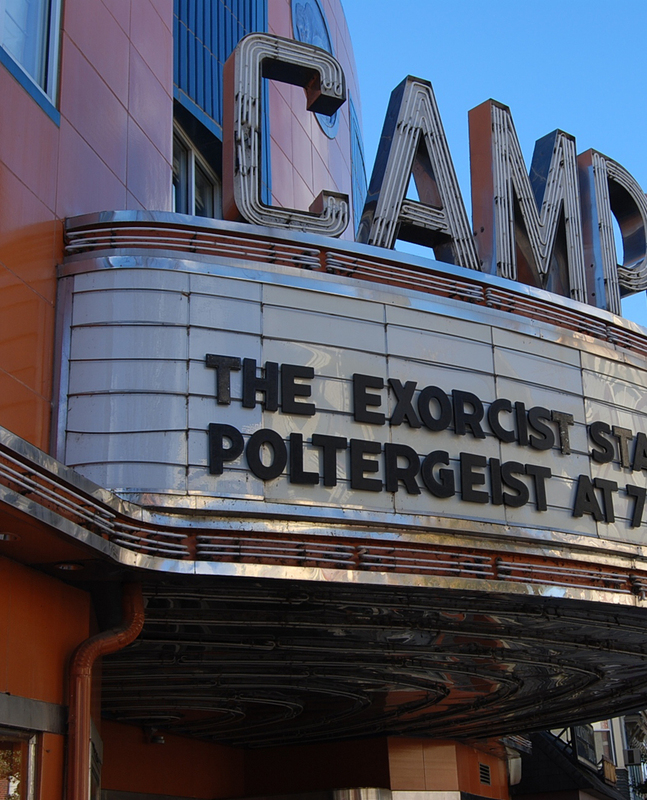 The Campus Theater’s movie house had suffered from many roof leaks in the last 50 years. Because of the substantial cost of repairs, leaks had been patched and repatched. Areas of water damaged artwork had been overpainted, sometimes eliminating design elements, simplifying design elements or moving them. Sometime in the past 10 years there was a major furnace blowback of oil, soot & dirt. 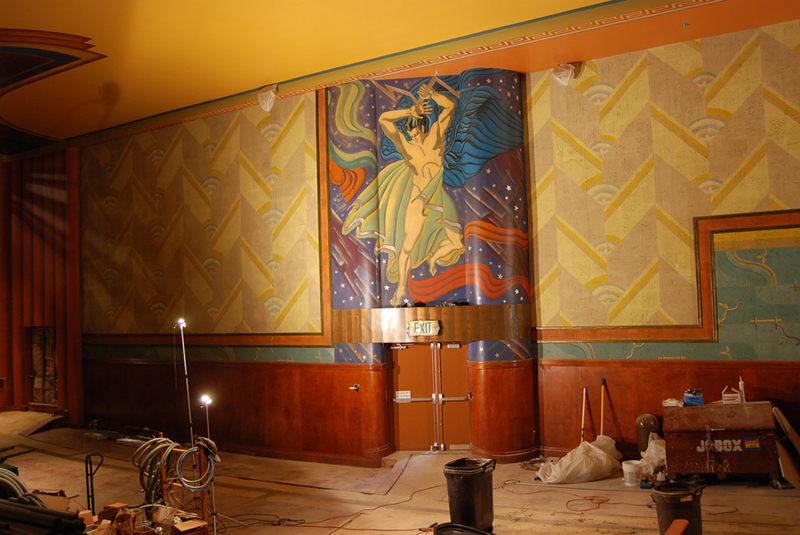 This covered and was embedded into all porous acoustical wall tiles and all painted surfaces drastically darkening the rich vibrant Art Deco decorations and murals. At about this same time, large panels of muslin covered fiberglass duct board were glued onto original walls to improve theater acoustics. These panels covering 3000 sq.’ were spaced evenly down the lengths of each side of the theater. 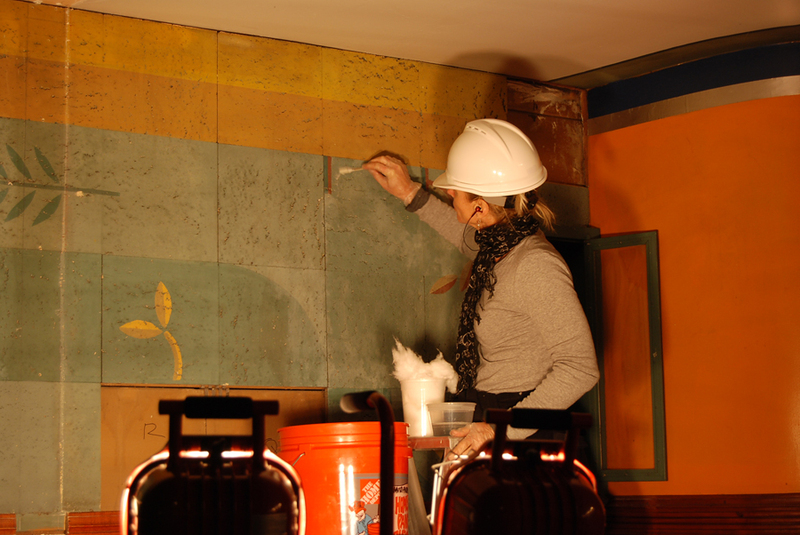 These new tiles were glued onto the original painted acoustical tiles with construction adhesive. Once beautiful, the lower mahogany like wooden panels were now nicked, scratched, dirty and stained with oily grease from human heads from the end theater seats leaning up against the walls. The ahead-of-their-time folding cushioned theater seats were now torn, stiff or broken. 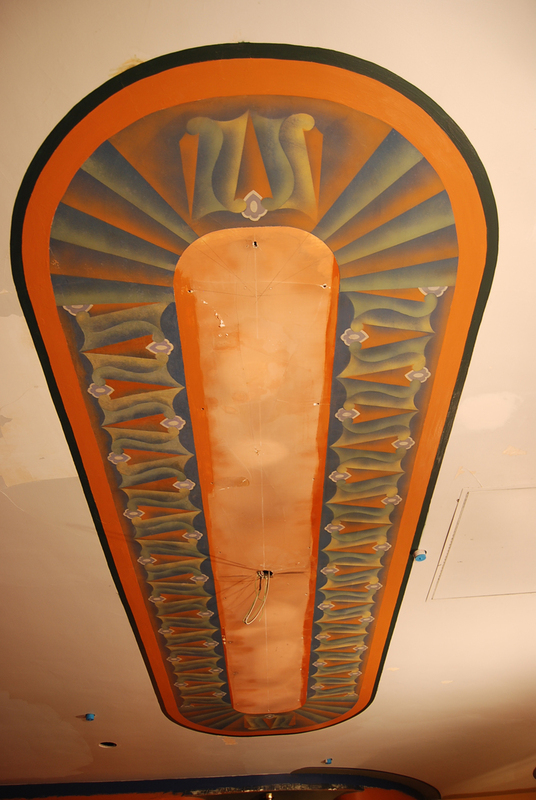 In the main theater there are: three large decorative design elements on the ceiling, Greek key patterns border its edges, repeating Art-Deco patterns cover the acoustical tiled walls, and two large allegorical figures (one male, one female) that rise 20’ high in the middle of each side wall above the exit doors. Painted 40’ high trompe l’oeil orange curtains flanked the front of the side walls matching the now tattered, soot covered and fragile original theater curtains on the stage. The lobby, entrance, upstairs bathroom lobbies also have colorful painted decorations around all ceiling lights, and a decorative bronze leaf border against the ceiling. The plumbing, heating system, water piping, restrooms (which leaked above the lobby ceiling), the carpet, and the original neon lighting fixtures were in a state of disrepair. They either didn’t work right anymore, were broken, had the wrong color or size bulb in them, were stained and torn, or no longer met code. Bucknell University realized the importance of this theater to the public, its students, and its historic importance to the revitalization of downtown Lewisburg. It saw a great opportunity to re-establish this once spectacular palace into an extremely useful, multi-discipline, multi-media facility with capability of providing meeting & school lecture spaces, movies, events, theatrical presentations and a forum for national presentations or public speakers. With the community’s support, Bucknell contributed or raised nearly $3,000,000 for the project. 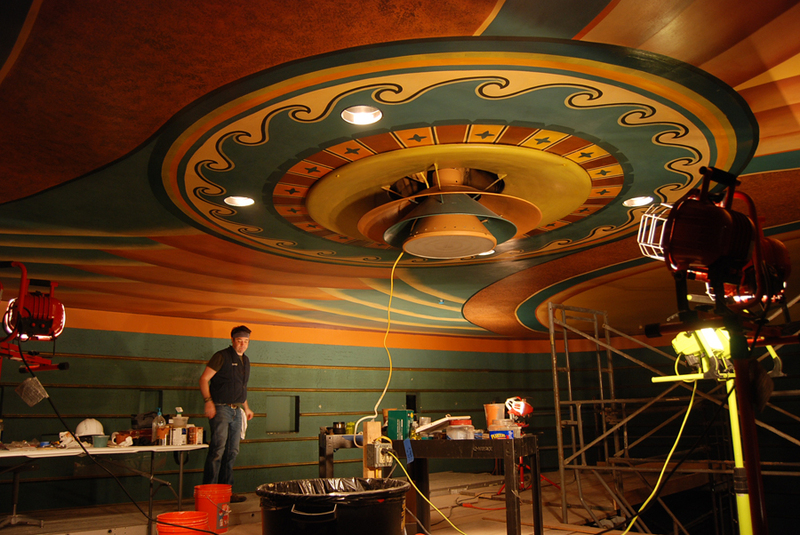 Hartmann Conservation was hired through the General Contractor, RS Mowery & Sons, Inc. to conserve & reconstruct approximately 9000 sq.’ of painted decorative surfaces in the main theater, lobby, entrance and second floor spaces at the Campus Theater. Because of University time constraints, replacement of major building systems, seating & some walls were happening at the same time in the same spaces as conservation. It was a challenge to coordinate all of the work of the construction crews and that of conservators using chemicals to clean walls, bright lights to inpaint, and the need to apply varnish coatings. The construction teams were exceptional, but they weren’t use to fussy conservators and we weren’t used to dust, jackhammering and little or no lighting. We however, all worked well as a team and brought the project in under budget and before the contract deadline. 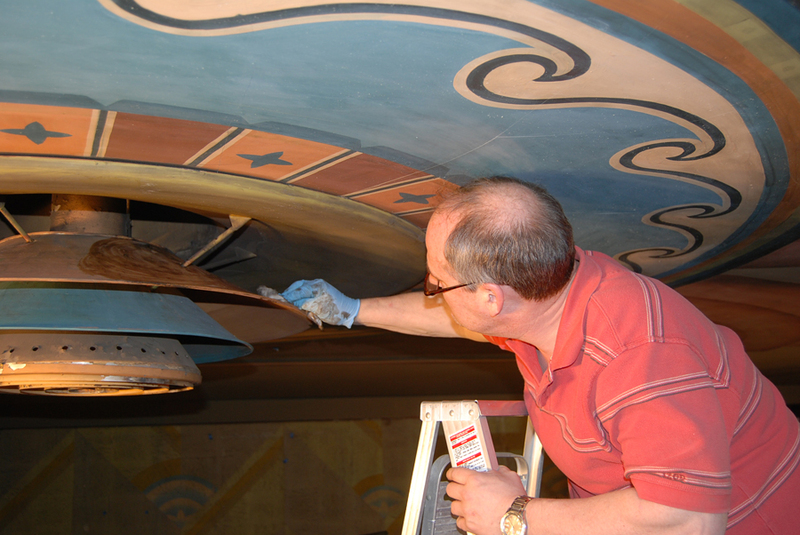 Conservation treatment of the theater took almost 14 weeks from February 2011 through the beginning of June 2011. Staff worked on several sections or design elements of the theater at a time fitting into the carefully planned construction schedule, shifting work to other areas when needed. Six to ten members of Hartmann Conservation were on-site at all times with some staff members being added to the team to accomplish specialty work – decorative painting, inpainting of losses, fabrication of missing elements or cleaning of surfaces. Scaffolding was provided by the General Contractor and used by all construction and conservation personnel. John Hartmann worked closely with the project architect, theater staff, and Bucknell’s Facility’s Engineering and Design Department performing historic paint analysis, helping everyone to better understand historic building details, and helping to devise construction solutions that did not adversely impact the original fabric of the building. 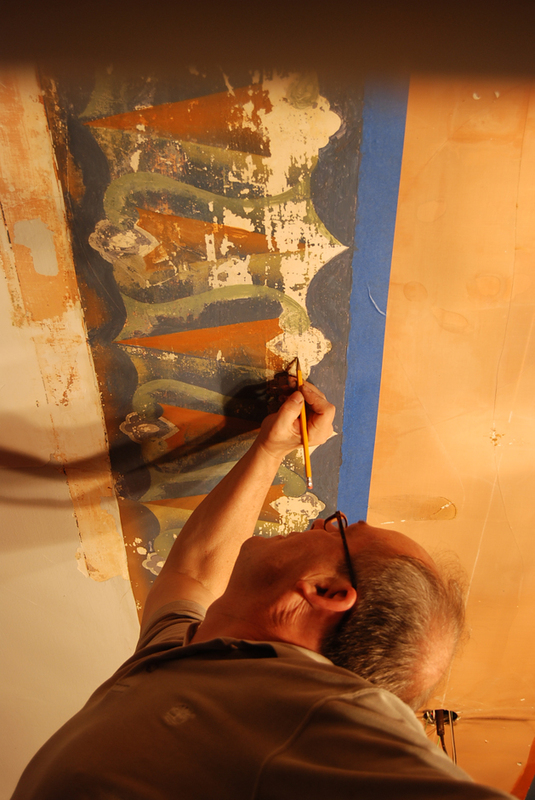 As a Bucknell graduate (BA in Chemistry & Art 1979), John’s past connections with both retired members of the art department, and older Lewisburg residents who remembered what the theater looked like 50 to 70 years ago was an added benefit for this project. We began our treatment with the removal of 3000 sq.’ of muslin covered fiberglass soundproofing panels in the theater. We cut the edges of the muslin and pulled the panels off leaving thick heavy construction adhesive firmly adhered to the original painted walls below. The adhesive was completely removed by first heating it and then scraping it off with metal cake icing spatulas followed by residual adhesive removal with organic solvent. All painted walls and ceilings were first cleaned with a mild detergent to remove the oily soot of the furnace blowback and then with organic solvent to remove discolored varnish coatings on just the plaster walls. Overpaint was found to cover large areas of replaced plaster on the ceiling and covering large sections of original artwork near the losses. Overpaint was successfully removed with organic solvents. About 200 painted acoustical tiles needed to be reattached to the plaster walls. Some had fallen off and were replaced in the wrong places because the painted pattern wasn’t correct. Losses in the acoustical tiles and plaster walls were filled, and then inpainted with acrylic paints, Goldens MSA (mineral spirit acrylic) Paints or mica powders. 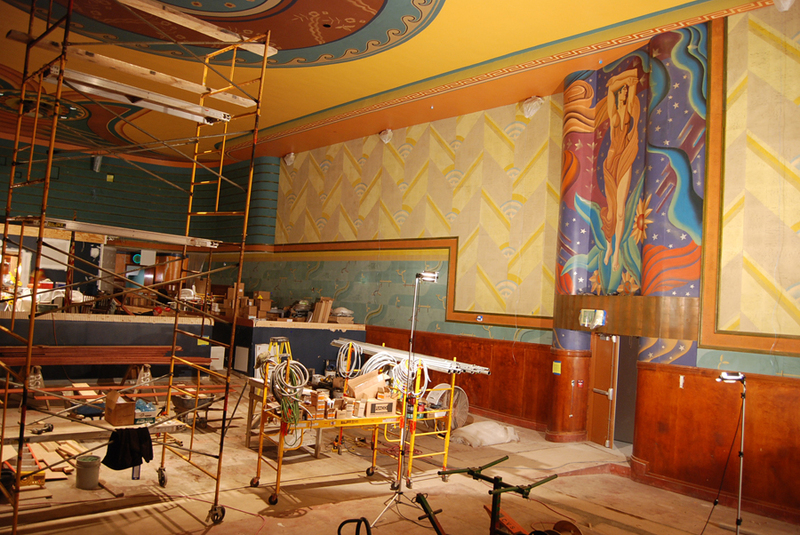 Several large sections of decorative designs in the theater and lobby were recreated to match the surviving original portions. 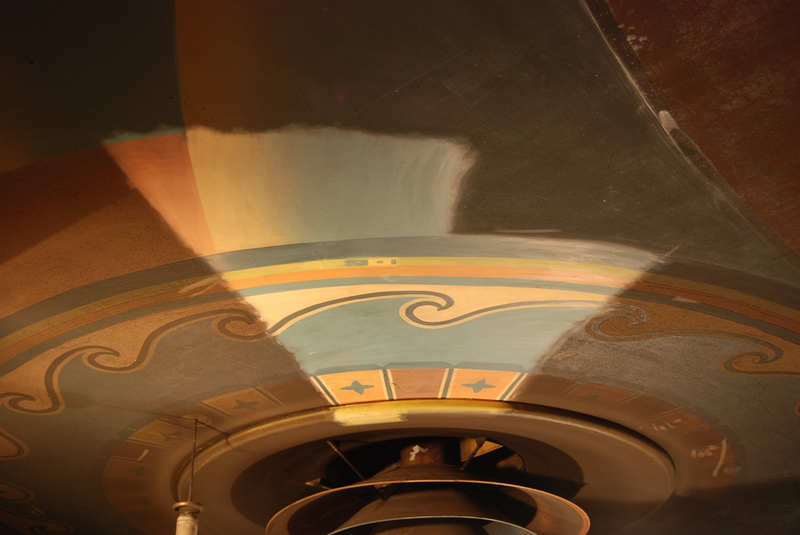 Applications of either matt or semi-gloss spray or brush varnish coatings were applied to all conserved painted plaster decorations or murals. The acoustical tiles were not varnished.